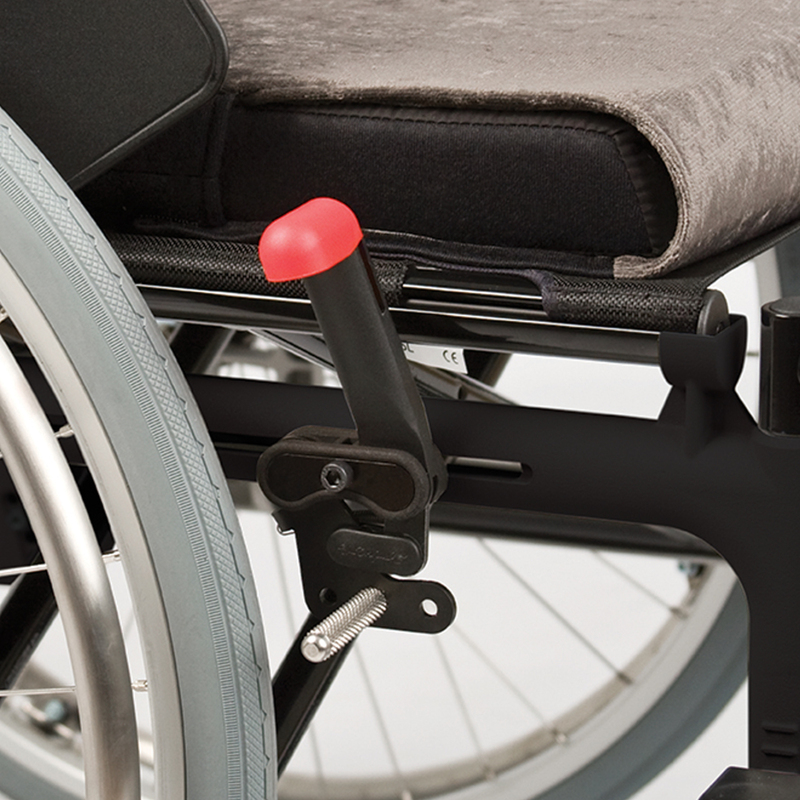 The Etac Prio is the only multi-functional wheelchair that offers a dynamic pelvic support. A support that deactivates while resting and reactivates in the active position. The dynamic pelvic support is only one example of Prio´s innovative functions that improve sitting tolerance over time. By supportive and shaping efforts you can improve the users ability to be active and mobile. 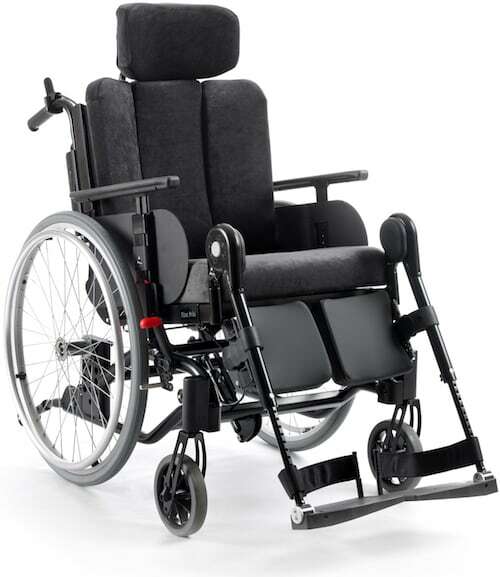 The Prio wheelchair achieves a high level of comfort through it's dynamic features. By changing the seat and back angles and adjusting the elevating leg supports, you can vary body position and pressure points. The pelvic strap is height adjustable for precise setting. Reclining the back will automatically reduce the strap tension and retighten when the back is brought to an upright position. The ideal combination for activity and resting. Start by setting the height. The back support is contoured by adjusting the straps. The protecting shields distribute the pressure and the soft back cushion will be perfectly sculptured. The Soft head support really deserves its name. Shaped in soft foam it allows the user´s head to sink in. 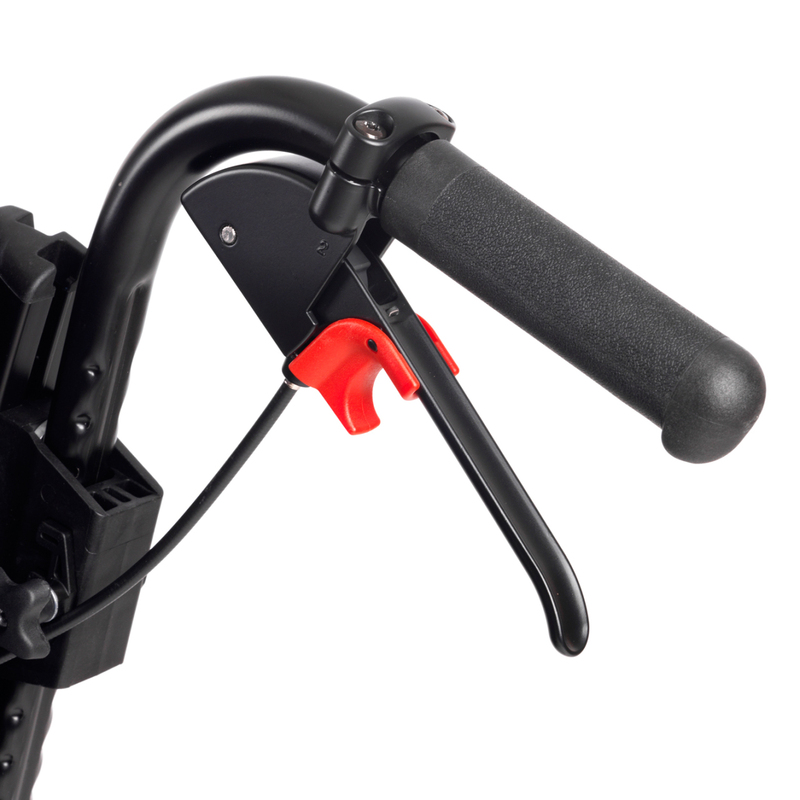 Height and depth adjustable and equipped with a memory function to ensure correct adjustment. Narrow wheel assembly (total width), low product weight and premium balancing options are features making Prio users more active and mobile. Height and angle adjustable, detacable. Recommended for users with kyphosis. Cover: Plush or grey hygiene fabric. Adjustable in height, depth, angle and sideways. The upholstery is detachable and washable. Combine with head support attachment. Soft and flexible back cushion, attached with zippers. Cover: Plush, green or grey hygiene fabric. Unique back system providing support and space for a kyphotic back or asymmetries. Height adjustable, detachable. Can be combined with attendant brake. Height and angle adjustable. Detachable. Can be combined with attendant brake. Fits Prio 40 cm, 45 cm and 50 cm width. Height and depth adjustable and detachable. With easy accessible angle settings at the front. The comfort cushion is slightly lower at the rear. To further improve the stability, it has a removable viscoelastic foam instert and contouring for the thighs. Cover: Plush, green or grey hygiene fabric. The Basic cushion is slightly lower at the rear. Cover: Plush, green or grey hygiene fabric. Reduce the angle options. The more clips added, the less the chair can recline. No tools are required. 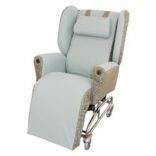 Prevents activation of the recline or tilt. To adjust the position, pull the locking device upwards, and then push it back down to lock. This function ensures the same preset tilt position. There are four alternative settings (0°, 4°, 8° or 12°). Choose one position that is frequently used for activity and rest. For 20″, 22″ and 24″ rear wheels. Provides a larger gripping surface. Available in black or red. With anti-slide handle cover. 10 cm (4″) between the handle grip and brake lever. Adjustable in height, depth and width. The arm support can be removed when the support is swung out. Ideal for side transfer. Cushion: Polyurethane. Adjustable in height, depth and width. Easily removed and installed without tools. Cushion: Pollyurethane. Reduces the seat width with 2.0 cm (3/4″). To be attached on the side guards. Increases the width between the arm supports with 2.5 cm (1″). Cell foam with Velcro attachment. Length: 13 cm (5″), Width: 9.5 cm (4″), Height: 2 cm (¾”). Sold per pair. Cell foam with Velcro attachment. Length: 19 cm (7½”), Width: 12 cm (5″), Height: 2 cm (¾”). Sold per pair. Cell foam with Velcro attachment. Length: 20 cm (8″), Width: 17 cm (6½”), Height: 2.5 cm (1″). Sold per pair. Swing-away and detachable. With foldable calf supports, adjustable in height and depth. Cover: Hygiene fabric. Detachable. Available in lengths of 20, 30 and 40 cm. Length: 21 cm (8 3/4). The platform provides a floor sensation and stimulates movement. Foldable and detachable. Side folding, elevating. Assembly on fixed, elevating and angle adjustable leg support. Transparent, mounted on the arm support. Distance that enables two additional seat heights for 16″ rear wheels: 40 cm and 42.5 cm. 20″, 22″ or 24″. Solid tyres. Quick release hub, aluminum handrim. 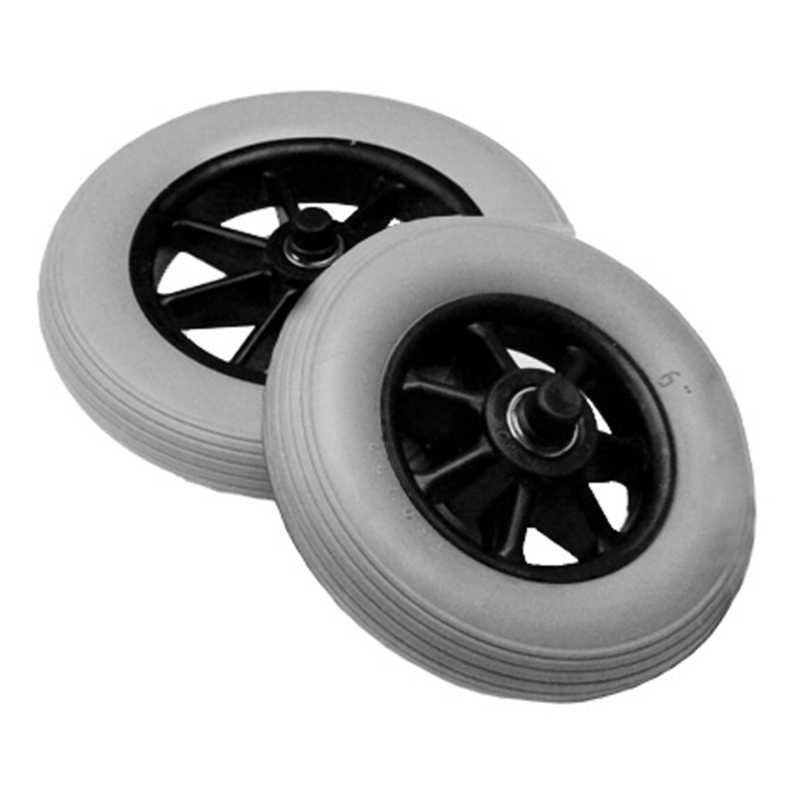 16″ transport wheels. Alternative fixing points on the frame. To be combined with traditional head support. The soft, padded side panels provide lateral support and creates a horizontal contoured shape. The centre panel follows the vertical shape of the kyphosis. A kyphotic back often requires a lower back height. The Prio 3D back support can be adjusted from 45 to 60 cm. The head can be positioned in front of the trunk. This puts demands on the depth adjustment of the head support. The users´s back must be supported from the pelvic area and up. The dynamic pelvic support is just as important for a user with a kyphotic back since it enables pelvic and spinal variations.